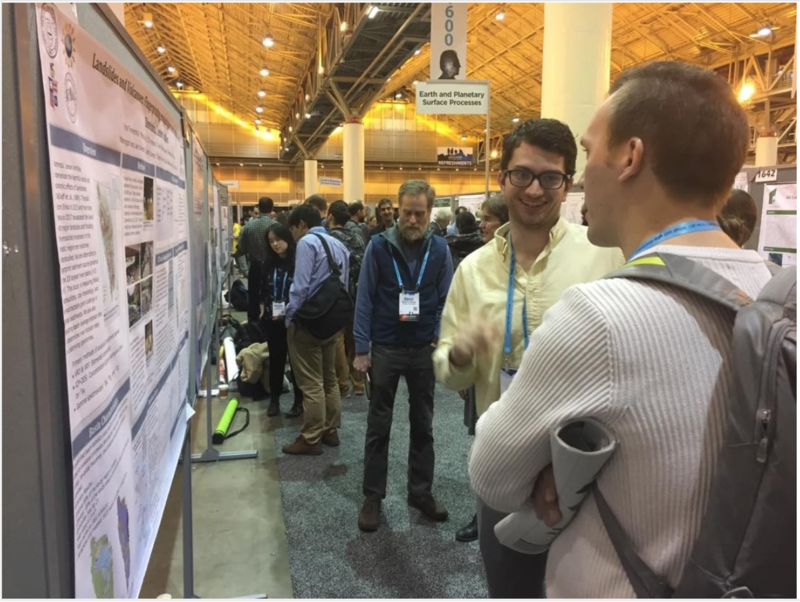 Three Wooster Geologists (Dr. Karen Alley, Dr. Alex Crawford, and senior Geology major Cole Jimerson) descended on New Orleans last week to attend the Fall Meeting of the American Geophysical Union. With 20 to 25 thousand attendees each year, this is the largest Earth and space science meeting in the world. On Wednesday, Dr. Crawford gave a talk about his research in seasonal sea ice prediction. As the Arctic continues to warm, seasonal sea ice melt is occurring progressively earlier each year. Although almost unheard of 20 years ago, commercial shipping along the Russian coastline (the “Northern Sea Route”) is now a routine summer operation. However, the seasonal timing of when the sea ice melts enough for normal shipping is highly variable from year to year. Dr. Crawford and his collaborators are investigating various ways of improving our ability to predict that variability. 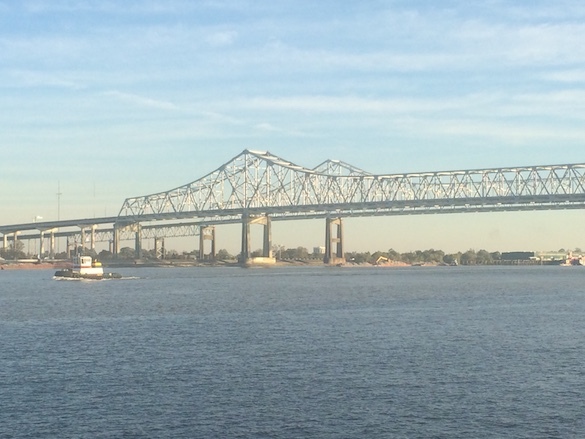 Better predictions can aid shipping companies in planning their summer routes. 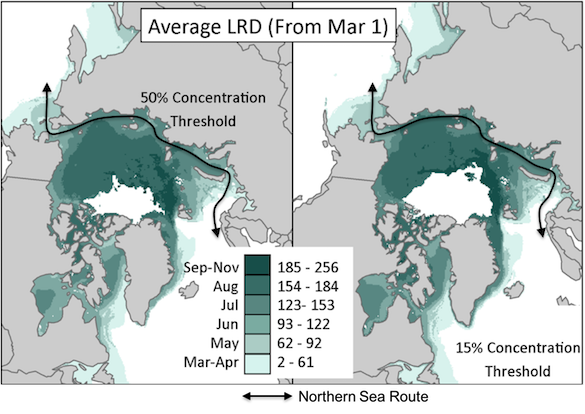 The Northern Sea Route through the Arctic Ocean and the “last retreat day” (LRD), which means the last day of the year on which sea ice concentration is above 50% (left) or 15% (right). Adapted from Stroeve, Crawford, & Stammerjohn (2016); 10.1002/(ISSN)1944-8007. 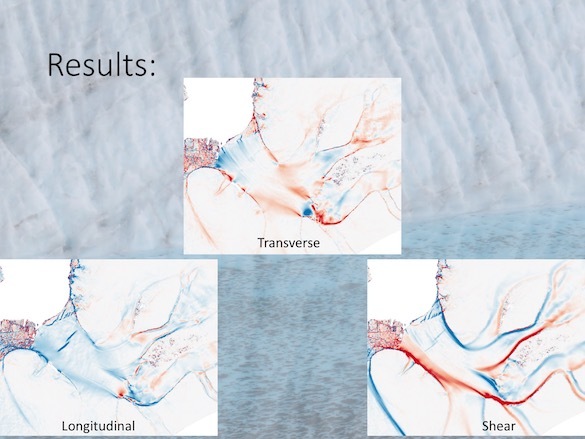 On Thursday, Dr. Alley gave an invited talk about a new data product she and her collaborators have developed for researchers studying the Antarctic ice sheet. Using ice velocity derived from satellites and sophisticated mathematics and computer coding, they calculated strain rates for Antarctica’s ice sheet and ice shelves. These strain rates are a measure of how fast the ice deforms by stretching and compressing as it moves. They are a fundamental parameter to know for anybody trying to understand how Antarctica’s ice is responding to climate change. Strain rates on the Filchner Ice Shelf, Antarctica. From Dr. Karen Alley. Finally, Cole Jimerson presented a poster on Friday overviewing some of the research he and other students performed through a Keck Geology project concerning erosion rates on the Caribbean Island of Dominica. Dominica is a volcanic island prone to explosive ash eruptions. Many of the rocks and sediments on the island are quickly eroded by rivers and chemical weathering in the hot, wet tropical climate. These and other factors lead to landslide risks, and better understanding erosion rates can improve hazard mitigation strategies. Cole Jimerson presents his poster at the Fall Meeting of the American Geophysical Union.